DANCES of Life and Death and The Inspiration of Night — composed by Zhuhai sojourner and English music educator Andrew Webb-Mitchell — were presented by the Shenzhen Symphony Orchestra and performed by soprano Ruan Yuqun at the Closing Gala of the 2014 Beijing Modern Music Festival (BMMF) in the Beijing Concert Hall on Thursday night. They were among a selection by more than a dozen leading Chinese and international composers from China, Russia, Canada, the US, the UK and elsewhere. “It was incredible, beautiful and very, very lovely; full of surprises. I was greatly satisfied,” exclaimed Webb-Mitchell afterwards. 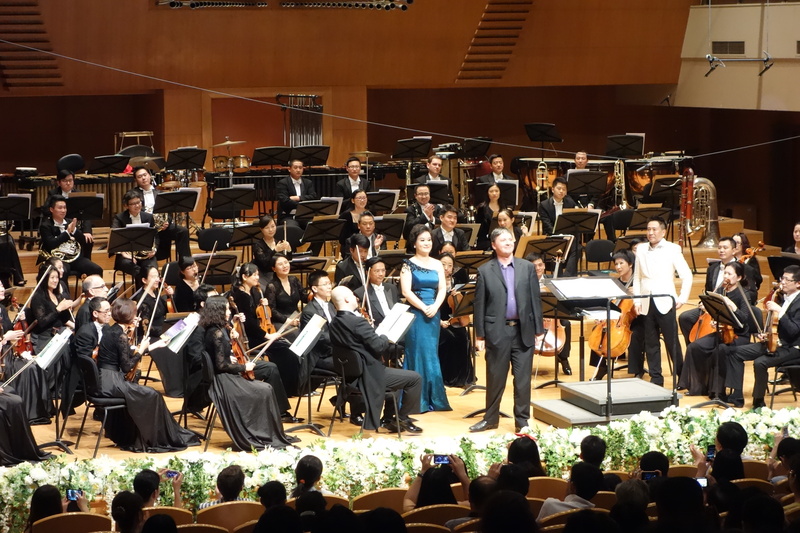 Conductor Hu Yongyan and soprano Ruan Yuqun, both at the highest classical music levels in China, did a fantastic world- class job, he added. The two songs are part of Webb-Mitchell’s symphonic song cycle, Songs of Awe and Wonder, with words by British poet Joanna Boulter. “That’s really moving, and that’s the last thing in my music as it dies away,” Webb- Mitchell said. The text for The Inspiration of Night takes us back to the dawn of time, suggesting the awe and wonder of primitive man as he gazed towards the heaven. The Nebra Sky Disc, which was found in a cache of bronze goods, shows an awesome and beautiful example of early humanity’s craftsmanship and skill in astronomy. Listening to his own music played in the closing gala concert of the Beijing Modern Music Festival — one of the major music festivals in China — and in the capital city of China, Webb-Mitchell said it was an enormous honour. He felt immensely delighted to meet others, who are the most talented and gifted composers of his age. The one who really moved him was 80-year-old Du Mingxin, who wrote music for The Red Detachment of Women, a household name of ballet throughout the world, and a national treasure of China. “Having been able to be on the same programme as this great man was extremely significant for me. I’ll remember that all my life. I was really excited that night just to meet this man and to shake his hands,” he enthused. Webb-Mitchell also expressed gratitude to Ye Xiaogang, artistic director of the festival, for giving him the opportunity to be at the concert. A musician with passion about the dissemination of classical music, Webb- Mitchell declared: “My next big project is an opera about Soong Mei-ling (Song Meiling).” Song, also known as Madame Chiang Kai-shek, was an influential historical and legendary figure in modern Chinese history. Supported by the Ministry of Education and Ministry of Culture in China, BMMF is an influential modern musical event and one of the most important modern music festivals in the world. It is committed to disseminating modern music, promoting international artistic and cultural communication and building a platform for young musicians. Webb-Mitchell established his first choral centre in Zhuhai last year in an attempt to bring the children’s choir to the highest professional standards, for example, the Vienna Boys’ Choir and the Westminster Choir in London, in three years. By then, he hopes, the choir will have the pleasure of collaborating with the Guangzhou Symphony, Macau, and Hong Kong Philharmonic orchestras and other leading arts organisations, he revealed when interviewed by the Zhuhai Daily last May.